You've probably used America's leading water transportation system— without knowing its name. The name is Midland. Nine respected companies. United by a commitment to superior water transportation services. Midland. Dedicated to saving you money. Midland. The most important name to consult when contracting your water transportation needs. Cornerstone of the Midland system. An important part of America's energy transportation industry since 1925, barging 20% of all coal moved on inland waterways. Delivering more bulk tonnage each year than any other carrier. Big. Dependable. And very cost competitive. Fast, dependable and low-priced capabilities for: New Construction. Mid-River Repair. Dry Dock Work. Boston Harbor to supertankers, con- tainer ships, battleships and luxury liners for over a century. 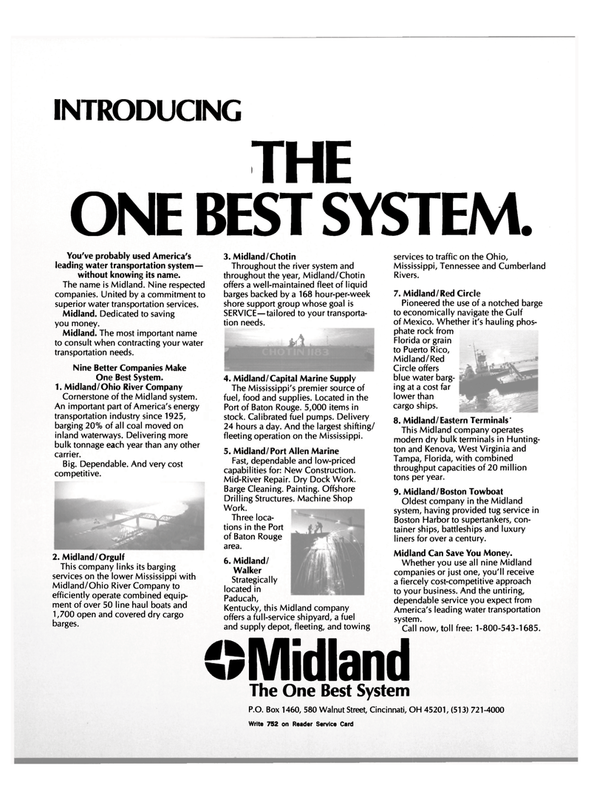 Midland Can Save You Money. America's leading water transportation system.